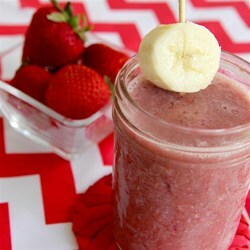 My creamy banana strawberry split smoothie is filled with protein and chia seeds for a great healthy drink! Go outside in a nice comfy chair, sit back, and enjoy! Blend almond milk, banana, strawberries, ice cubes, protein powder, vanilla extract, honey, ground flax seeds, ground chia seeds, and cinnamon in a blender until smooth.